The recent announcement that Lene Vestergaard Hau had successfully changed light to matter, and then back into light, evokes the magic of carrying moonbeams home in a jar. That the general public might harbor doubts about the success of such research is understandable, but Hau says even her fellow physicists were skeptical. “My colleagues would say, ‘Why would you even try these experiments? It won’t work right,’” says Hau, Mallinckrodt professor of physics and of applied physics. From the top: Laser light coming in from the right (frames one and two) illuminates two “pools” of supercooled sodium atoms. Then a quick pulse of laser light coming in from the left (frame three) enters the first pool (frame four), forming a crescent- shaped matter wave, which traverses the free space between the pools (frame five). Once the wave has entered the second pool (frame six), a second laser light “revives” the matter pulse, turning it back into light (frame seven) that speeds away (frame 8) at 186,000 miles per second. 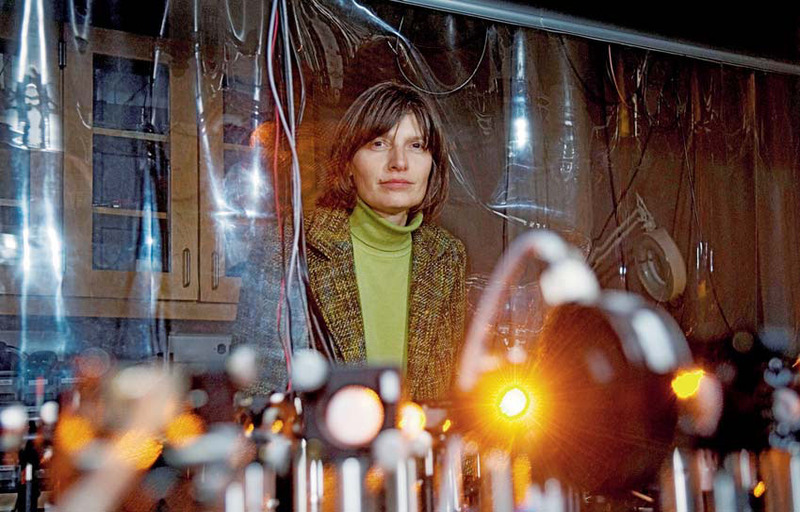 Her latest achievement builds upon a succession of discoveries that began at the Rowland Institute in Cambridge in 1999, when Hau’s team first used supercooled sodium atoms to slow light pulses down to 38 miles per hour from their cruising speed of 186,000 miles per second. By 2001, Hau was able to halt the light pulse completely before sending it on its way. In the spring of 2006, Hau began a new round of experiments, in the Cruft Laboratory at Harvard, using the same 5- by 16-foot optics table that she had used to slow and stop light. The table floats on high-pressure air and, Hau says, is “absolutely filled to the brim with optics and optical gizmos, laser systems and vacuum systems and electronics everywhere.” In the midst of an experiment, lasers criss-cross the table, lighting up the room. “We have people come into the lab who say, ‘My God, it looks like a Chrismas tree," she adds. The lasers do more than delight onlookers. One set works to illuminate the experiment in progress, allowing the team to create images and measurements of the test; others are tuned to a specific frequency and focused on two tiny “clouds” or “pools” of neutral sodium atoms (each pool only a tenth of a millimeter in diameter), in order to cool their temperatures to within a few billionths of a degree above absolute zero. At this temperature, Hau says, the atoms in the pools begin to act in lockstep—a phase referred to as a Bose-Einstein condensate. Once the pools have cooled, the researchers use electromagnets to hold the viscous mass of atoms in place at a constant temperature. With both of the condensate pools cooled and kept about two-tenths of a millimeter apart, another laser is turned on for a few millionths of a second, emitting roughly a kilometer’s worth of light pulse. When this pulse enters the first pool, the condensate applies the brakes. The light is slowed down to 15 miles per hour and contracts to less than one-thousandth of an inch. Then, as the pulse begins to make its way across the first pool, what Hau describes as “a little boomerang shape” takes form: a matter imprint of the light pulse—traveling at “a slow walking speed” of 700 feet an hour—leaves the first pool and “strolls out” into free space. When it reaches the second pool, the firing of another laser revives the pulse, which revs back up to its normal speed and heads back on its way. And that matter—that little boomerang of sodium atoms moving between the two pools—offers countless future breakthroughs, Hau says. In conjunction with her earlier research, this new discovery draws a blueprint for a quantum computer. “With our early experiments, we made the memory,” she says. “Now, in this experiment, where we can intentionally change the optical information, we can start to make the processing unit.” Future computers, instead of relying on electrical impulses, could rely on this type of light-form data, she explains. This would allow not only for faster transfer of information, but for more secure data, because any attempt to decode the information would change the state of the matter, making intercepts easy to detect. Superfast, superpowered quantum computers would also be able to encode light data with massive algorithms that even a supercomputer would need years to decipher, providing an additional layer of security. “There are so many things we can start to do—it’s just a matter of, ‘Oh gee, what should we pick?’” says Hau. Whatever the choice may be, it’s likely that this time, her colleagues—doubters no more—will be watching closely.